The Literacy Connection events are always two of my favorite days of the year. Last week, we were lucky to learn with Pam Allyn and it was an amazing day! So much that I have been thinking about all week. And such an amazing group of people to learn with! At the end of the day, all of us full of great energy! Pam left us with lots of wisdom and the following is a list of things I wrote down that I wanted to think more about. So much positive energy and hope and belief that we can make good things happen for our students. I thought I'd share these wise words from Pam with you. You get to know going to sleep at night that you did something. Busy People get things done. Open yourself to the potential that’s in you for the work. All of us can be better. The thing about literacy is how urgent it is. All of my work is about a sense of hope. Literacy is the foundational goal of all goals. At the end of the day, we have a lot more power than we think. Much harder to turn a 15 year old than it is to turn a 5 year old. Let’s think about what we can do to make us. We can make something happen. We don’t have to wait. We do have a lot of evidence for what really works. But sometimes we don’t really believe it. All the research shows us that independent reading where kids get to make choices is a key part of success and will improve test scores. Deficit language is really hard for kids to get over. We were so lucky to have Pam with us for a day last week. In April we'll have Ernest join us to close out the year. (You can register to hear Ernest at The Literacy Connection's website. 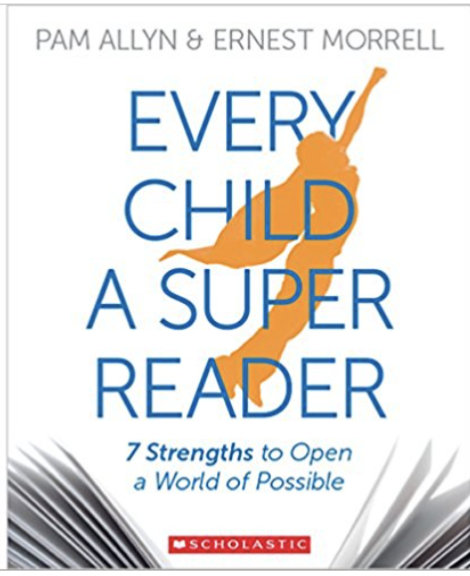 As part of our yearlong study this year, we are reading the book that Pam wrote with Ernest Morrell, Every Reader a Super Reader. It is an incredible book that I highly recommend.